Paimon is a great Fomori King. He is more deferential to the great Goat God of the Witches than other Fomori Kings. His estate and domain lie in a northwestern branch of the Great Oak, and your thaumaturgic circle should point in that direction when summoning him forth. He commands 200 legions of his brethren. This Demon has been worshiped as a god by many ancient peoples, and he expects nothing less from those who are intrepid enough to conjure him forth. He is said to be one of the better tempered demons to deal with. Paimon has a great voice and roars in a deafening cacophony when he first appears, and will continue in this manner until the conjurer compels him to do otherwise. He will then answer clearly any questions he is asked… whether truthful or deceitful is another matter though. 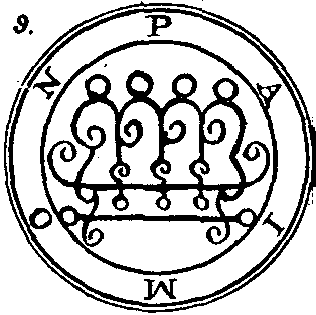 Paimon usually appears in the form of a man with a feminine face and figure. He wears a crown encrusted with gems and precious metals, and often appears while riding a black dromedary, also known as a camel. Paimon is usually accompanied by a host of other demons, some sources quoting 25 legions… a potentially deadly situation. He has also been known to appear with two other great Fomori Kings that serve him, Labal and Abali. These two Demon Kings have no known seals.